Let's kick off Techweek19 ? Register now for 50 Angels Flying ? The voting for The Property Crowd and Zeddy is now complete. They both got very close but neither of them got over 50% support for FKA to lead the round. Zeddy landed exactly on 50% and there are several Flying Kiwis who will assist with DD under the lead of MIG Angels. If all stacks up they will bring Zeddy back to FKA as a co-investment opportunity. Late breaking news, disappointing news. It seems that ICE money doesn't want to mix with FKA money. So we wish James all the best! Our 50th Pitch Night had all that one could wish for: two great pitches, a proud update from a portfolio company, lessons learned from the coal face and a sabrage that topped all so far - we just need the video footage to prove it. There were 50 or so phones out to record it. Please send your clips to rb@fka.nz ? Hopefully, the Lime run will pass without incident. Straight after you can roll on to the Health Tech Investment Showcase. Read more about this NZTE ATEED event and register here. We now have the pitch video from Zeddy. Voting is underway. Voting for The Property Crowd is still undecided. Some more votes are needed to have a clear majority, one way or the other. Debra called for cake and champagne to celebrate with staff and investors after the first FormusLabs board meeting. This was almost like a christening of our portfolio company #15 which marks the midpoint of our second batch of 10 companies. Late breaking news! Moxion has just appointed Philip Ashcroft as President, North America. InvesTinder was a successful April Fool Joke by Brent S. Ogilvie, the man who had a great exit with sperm counting tech. Did he have that middle name before the exit? For Techweek19 we're looking for 50 Angels from across New Zealand and other early-stage investors to take flight on Lime scooters to visit various companies that are all about transport innovation. Pencil 20 May! There are VCs working the NZ Angel space and they are very much aligned. It's important to separate the VC-Angel conflict of the Valley from our local circumstances. To this end but more importantly the benefit of Kiwi startups, Simmonds Stewart et al are bringing several VCs to our shores for Techweek19. Find out more and register ☞ HERE! FKA's Chief Cat Herder Rudi circulated an email to all active FKAngels with instructions to access a new section of the website with Internal Resources. A little hint: The password was contained in the image. Jackie has a day job as CEO of the ecentre where lots of founders are working on their startups. From time to time she calls on fellow FKAngels to help, such as Cornelius, Debra, Ralf W and Rudi. He was put in the ring on Wednesday with Sara Perry, Bootstrapping vs Fundraising. Interesting conversation discussion, pros and cons on both sides. NBR was in the room and might follow up. FKAngels and AU students congregate every year at the Velocity competition which has produced many startups that have grown into great Kiwi companies, among them portfolio company #02 Kami. CEO Hengji was one of the judges and mentors last year. Read more about the programme here and simply join here. Future Unicorns? 50 of them listed in this CB Insights research brief. For a contrasting and very interesting article read this CNBC report. "Expect to see more dead unicorns." This is the first of two pitch videos from our March Pitch Night. Very topical with all the movements in the property market and demographic developments in New Zealand. Thanks for bring it, Lachlan! Understanding your motivation for becoming an angel investor and having an appreciation for the risk profile and mechanics of angel investment is all covered in this succinct 'awareness raising' course, run by AANZ 4x in April and facilitated the one and only Ken Erskine. NZVIF is scouring the country high and low to look for talent to strengthen the team and to replace Aaron and Hattaf who are leaving. We'll miss them and wish them all the best for their next endeavour. ☞ 1x Director Position & 1x Analyst Position! AANZ Flight is a programme that aims to lift the lead angels of the various angel groups to higher heights. This, in turn, should benefit all angels to get better results. The Waiheke session last weekend was productive and well attended by 1x AA, 2x AHQ 2x FKA, 1x GD1, 2x IA, 1x Zino and 2x AGG [Angel Group Groupies] Phil (EA, FKA, IA) and David (FKA, IA). It's no April Fool Joke but our angels in the Far North are trialling a new time ☞ 7-9am, 1 April. Useful advice, connection and more for Northland startup founders! We have to assume that Martin and Lawrence want to hit the water to go kitesurfing from 10 am. They say they are AB testing to find the best time to catch founders. The early angel catches the founder! 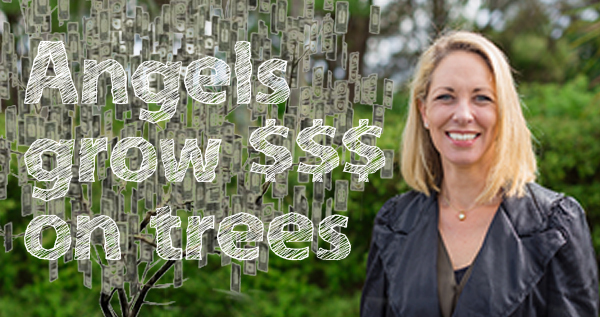 LinkedIn posts: 1) Jackie and her money tree is a warm up to April Fools and a great video, 2) ADI.Clinic - no rocket fuel injection, 3) Watch out for open-air pitch nights and special Angel gowns. Interesting blog by Spotify founder Daniel EK on Apple's anticompetitive measures. This is going to court in Europe. Hola, Isabel! No skeletons were found in her closet. Better still, she brings Spanish temperament to FKA. Good to have a matador when wrestling with unicorn founders. Let's also acknowledge two angels who have reactivated after a period of hibernation. Welcome back Lachlan and John! With that our active angel count stands at 56. GD1 Fund II & FKA Portfolio Company Vesper Marine is an emerging global leader in Marine Safety software and now raising funds led by GD1 to resource: 1) Converting the growing Enterprise sales pipeline, 2) Enhancing Marine Asset Protection product features, 3) Marketing spend to launch of its next-generation products, 4) Adding senior US & UK sales execs to the team. Tues, 26 March 1700-1900, drinks and nibbles too, pls RSVP. Great Pitch Night on Tuesday! The above was one of three pitches, Zeddy.com, plus Amy.app, plus ThePropertyCrowd.co.nz. The DD Voting will kick-off when we receive the pitch videos from the founders. Kate wants to include real footage from the paddocks which could prove challenging with cow extras. This could be a pitch video like few others! Great hosting from James and Daisy at KPMG, THANKS! Rudi ran a little «How To Pitch Your Startup» session last Thursday under GridAKL's regular lunchtime format. Pizza is always a good carrot but didn't seem that important to this interested crowd. 30 mins turned to over 60 with lively Q+A. This is GridAKL's blog on The art of startup pitching with Rudi Bublitz. It was in August 2014 when co-founders Jonny and Chris and Equitise made the first contact and came to ADI.Clinic. A little cocky but they took the candid feedback well. In 2016/2017 we experimented with Equitise to improve deal closure and cash collection on their platform. Being smart founders, they iterated this into a strong value prop for brokers and lead investors. This gave them a competitive edge when they returned to Aussie as the crowdfunding legislation over there caught up. Note: Rudi and Lachlan are investors. Rudi served on their NZ advisory board. Nice video that sums up interesting science about pay and incentives. More pay can actually be counterproductive! Over 16,000,000 have already watched "The surprising truth about what motivates us".